Waitomo TOP 10 Holiday Park hosts for over 20 years, Bruce and Julie Tobeck, provide a warm and welcoming atmosphere. Their friendly Waitomo hospitality ensures your stay is as enjoyable as it can possibly be. They are backed up by their staff; Managers Rich and Kim, with Elliot and Jess in the reception, as well as the fantastic housekeeping and grounds keeping team. We would love to hear from you to discuss your next Waitomo holiday To make your arrangements, contact one of the team at Waitomo Holiday Park now. You can expect outstanding service and excellent holiday park facilities during your stay in any of the Waitomo accommodation options; plus an overall relaxed atmosphere at any time of the year! 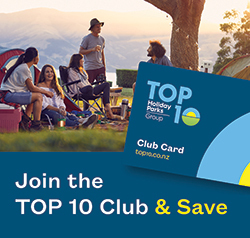 Waitomo TOP 10 Holiday Park is the ideal place to stay for a fantastic North Island holiday near the Waitomo Caves, NZ. Our Waitomo accommodation has a unique park-like setting and is located right in the centre of the Waitomo Village. 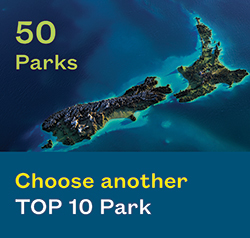 Choose Waitomo - for a great Kiwi holiday, and stay where the Kiwi’s stay: at a TOP 10 Holiday Park. 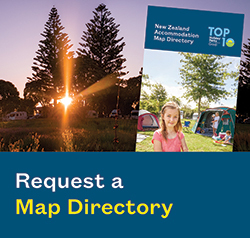 TOP 10 Holiday Parks have, for over 25 years, set the standard for New Zealand Holiday Parks (camping grounds / motor camps), so you can be assured of great value for money and beautiful clean facilities. 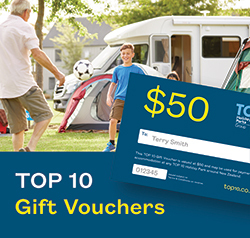 We are proud to have won several Top 10 Holiday Park awards including two supreme awards and several top service awards.